C.P. Porter made a rather spectacular and emotionally-uplifting return to football Saturday. The senior running back shattered his leg a little more than 11 months ago. 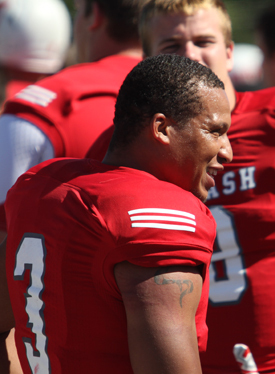 Porter's 2012 season came to a gruesome halt when he broke his leg Oct. 20 against Wooster. Porter returned looking like he'd never missed a beat. He capped a 10-play scoring drive, carrying the ball seven times himself, with four-yard push across the goal line. The defense stood him up at the four but Porter’s healthy legs drove the pile into the end zone. Porter carried the ball 6 times for 36 yards and the score. He admitted the leg is still on the mend.